Would you like to take a tour behind the scenes to sample some of Eggenberg beers, discover secrets of how this golden vintage is made of taste traditional delicacies from South Bohemia in a stylish restaurant? The tradition of brewing beer in Cesky Krumlov comes from the beginning s of the town. The first written documentation is from 1336. The brewing flourished under the reign of the Rosenbergs as well as the Eggenbergs and the Schwarzenbergs. In 1560, a new brewery was built in the castle grounds. A year later was established a source of very high quality water, that is used until today. The increasing rate of beer consumption was a good reason to rebuild a part of the Rosenbergs armoury for a brewery. The estates were reconstructed from 1625-1630 into the new buildings of today�s brewery. The owner of Krumlovs dominion, Johann Ulrich von Eggenberg, heralded the brewery into operation in 1630. In 1719 the Schwarzenberg family inherited the Czech Eggenberg property. This period was very significant for the brewery. At this time the brewery expanded into the form we know today. In 1945, the brewery came under state ownership. Since 1991, when the brewery was privatized, uses trademark Eggenberg. Eggenberg brewery in Cesky Krumlov produces today five types of beer. Excursions for individuals are guided in Czech, German and English language. Meeting of all participants is daily at 11 o'clock by the brewery gate. Brewery is located on North-East edge of the historical center. 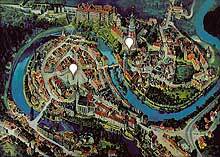 There is a guarded parking area (the largest in the town) in the very vicinity of Cesky Krumlov Eggenberg brewery.